Raiders of the Lost Ark is an American film produced by George Lucas, directed by Steven Spielberg, and released in the summer of 1981 by Paramount Pictures. Starring Harrison Ford as archaeologist Indiana Jones, the film sparked three sequels and a television series. It is the first film in the Indiana Jones series, though the second chronologically. Indiana Jones is a maverick archaeologist just returned from a harrowing adventure in Peru when he is brought before a meeting with two men from Army Intelligence: why are the Nazis looking for an Egyptian headpiece in the possession of Jones' mentor? The realization is that the Nazis are after the long lost Ark of the Covenant, the chest the Hebrews carried in ancient times. 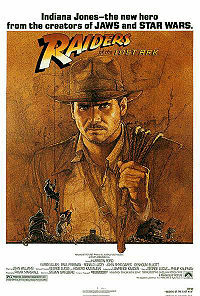 Seeing the significance of it, Indy is commissioned to find the Ark before the Nazis do. Harrison Ford: Dr. Henry "Indiana" Jones, Jr. When Kasadan, Lucas, and Spielberg were conceptualizing the movie, Lucas suggested that they have Marion Ravenwood lose her virginity to Indiana Jones while she was 11 years old and he was 42 years old. George Lucas: I was thinking that this old guy could have been the mentor. He could have known this little girl when she was just a kid. Had an affair with her when she was eleven. Lawrence Kasdan: And he was forty-two. George Lucas: He hasn’t seen her in twelve years. Now she’s twenty-two. It’s a real strange relationship. Steven Spielberg: She had better be older than twenty-two. George Lucas: He’s thirty-five, and he knew her ten years ago when he was twenty-five and she was only twelve. It would be amusing to make her slightly young at the time. Steven Spielberg: And promiscuous. She came onto him. This page was last modified on 26 September 2018, at 14:25.